Association with Co Kildare town dating back to the 13th century comes to an end due to a lack of friars. At the end of the last Mass in St Dominic’s church in Athy the Dominican friars led a procession of their parishioners through the town to St Michael’s parish where they handed over their former congregation into the custody of that parish. 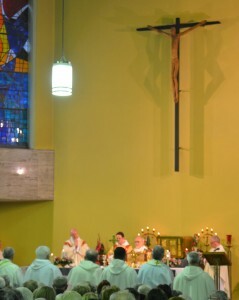 Addressing a congregation of up to 1,000 parishioners and well-wishers, including Bishop Eamon Walsh, Fr John Harris OP spoke about the closure of the Dominican community and church in Athy Co Kildare. Referring to the occasion as “a terribly unhappy day indeed” he explained that the association dating back to the 13th century was ending due to a lack of friars. He said the Irish province of Dominicans had made the decision with “heavy hearts” but they had to face the “realities of today”. In 1965, there were 425 Irish Dominicans but now there are 162. In 1972, the average age of the friars was 44, now it is closer to 74. In 1965, about 10% of the order was over 65 years old, now it is 56%. “We can’t blame Henry VIII or Cromwell this time,” Fr Harris quipped, a reference to the forced closures in times of religious persecution in the past. Acknowledging that “Everyone in this church today is sad”, he said they must all look to the Gospel for the feast of Christ the King for guidance and hope, for consolation and vision. “Our God touches our pain with healing, our sadness with joy, our grief with consolation and most importantly for us today, closure with hope,” he said. 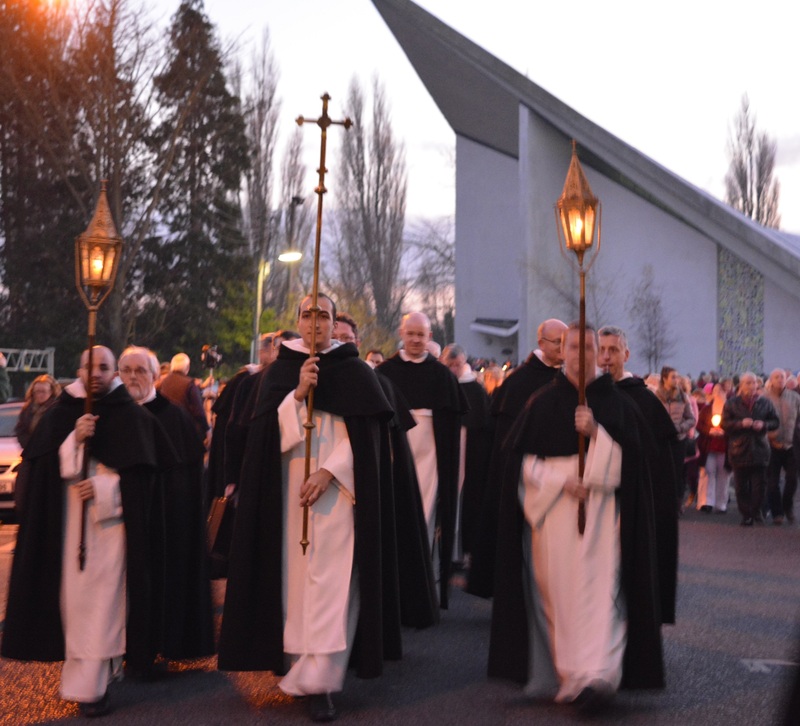 After Mass, the friars led a symbolic candlelight procession through the town to St Michael’s parish where they handed over their former congregation into the custody of that parish. Spokesman for the Dominicans, Fr Bernard Treacy OP told CatholicIreland.net that St Dominick’s church and the entire parcel of land around it is being given to the local county council to be developed for community use. “I understand that the church will principally become a library. It will have other cultural uses,” he said. Parishioners here will now become part of St Michael’s parish, he explained. Asked if a sudden turnaround in vocations would change the situation, Fr Treacy explained that even if the order got 20 vocations every year for the next five years, it would still be 10 years before any of those men would be ministering as priests. “The immediate problem would remain,” he said. This is the first of five closures announced by the Dominican provincial Fr Gregory Carroll in September 2014. Other centres in Dublin (Leeson Street house), Drogheda, Waterford and Limerick are also due to be closed.